Frederick Winslow Taylor (1856-1915) circa 1900. Every day, thousands of people confuse Lean management with “Taylorism,” properly known as Scientific Management. The negative association brings out those who work hard to create a great separation between Lean and Taylor. This is an ill-informed and inappropriate response. It is also an irresponsible response because it misleads people. The leaders of the Lean movement, in particular, should not mislead people through their own prejudice and ignorance. And those who speak loudest about “Respect for People” are quick to shower Frederick Winslow Taylor with disrespect and other forms of disdain and mistreatment. Taylorism has been a heavy anchor around Lean’s neck for more than 30 years, and it will continue to be unless a wiser strategy is undertaken in response to confusion between Scientific Management and Lean management. 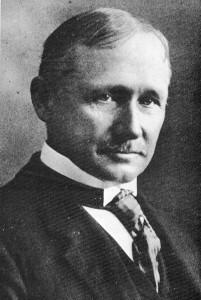 Rather than trying to paint Frederick Winslow Taylor as a villain, which he was not, the smarter and more accurate action is to respect Taylor and recognize him for his accomplishments and how his work, and that of his colleagues, were necessary first steps in the evolution of progressive management that helped pave the way for Toyota’s management system decades later. Toyota made use of Taylor’s time studies, Frank Gilbreth’s motion studies, standard work, and other important practices that form the bedrock of the industrial engineering methods used in kaizen and which, in turn, resulted in huge productivity improvements at Toyota that helped propel them to where they are today. Here is why you should respect Taylor as much as you respect Henry Ford and Taiichi Ohno. Taylor came from a wealthy family, but instead of taking the easy path he became an apprentice patternmaker and machinist. He worked his way up from the shop floor to supervisor. So, from his years of experience in the shop, he knew well the machining trade, how workers worked, and how they sometimes did not work. It is here that Taylor began to develop his system of management – by getting his hands dirty on the shop floor and then putting his ideas into practice, via experimentation, in collaboration with the workers that he supervised. Based on this work, Taylor was later credited with creating a new technical discipline called Industrial Engineering. What do Lean people value and respect in a person? Hmmm, let me think: Getting your hands dirty, knowing the job, doing experiments using the Scientific Method (and its derivative forms), collaborating with workers (teamwork). Taylor thought the shop floor was where learning took place and experiments were the best means by which problems could be solved. Sound familiar? Keep these things in mind as you read on. From there, Taylor worked his way up to become an executive. Later, Taylor and his steel company colleagues did years of careful experiments on the composition and heat treatment of tool steels, which led to an immensely useful invention called “high-speed steel.” The royalties from patents for high-speed steel made Taylor a wealthy man. Taylor was a pragmatic, fact-based person, skilled in engineering and experimentation, persuasive in getting people to try new things, an inventor, the developer of a comprehensive new system of progressive management based on the Scientific Method, and the father of industrial engineering. Don’t run away from Taylor; take pride in him and his work! It strengthens Lean management, not weakens it. The high-speed steel invention and, later, the book The Principles of Scientific Management made Taylor internationally famous. But it also earned him some unwanted notoriety. Managers in the U.S. who read his book adopted only pieces of Scientific Management, not the system in its entirety. 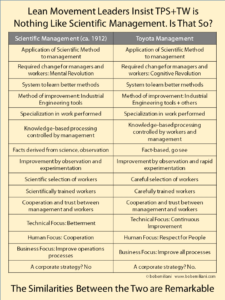 Taylor’s camp advocated for REAL Scientific Management (“Betterment” and “Cooperation”), while business leaders adopted Fake Scientific Management (“Betterment”). Sound familiar? The practitioners of Fake Scientific Management were called “fakirs,” “quacks,” “cranks,” and “charlatans” by Taylor’s associates. The widespread adoption of Fake Scientific Management by managers in industry got Taylor into trouble, and he was summoned to testify before a Congressional subcommittee in January of 1912 to explain the Taylor system. He did that, and also patiently and eloquently explained the difference between Fake Scientific Management and REAL Scientific Management. Taylor’s testimony provided many memorable quotes, including this one: “It ceases to be scientific management the moment it is used for bad.” We can say the same about Lean management today. Taylor’s book, The Principles of Scientific Management, was translated into many languages, including Japanese, and was a very popular book in Japan. It was adopted by Japanese business leaders in the spirit that Taylor had practiced himself and which he had intended: REAL Scientific Management (“Betterment” and “Cooperation”). The existence of Fake Scientific Management was far less prevalent in Japan than in the United States. Judging Taylor’s work in the 1880s against the current standard, Toyota, is thoughtless. Further, Taylor and Ohno were trying to solve different problems in different eras, through the methods for doing so had considerable overlap. Taylor faced a sellers’ market while Ohno faced a buyers’ market. Taylor was concerned about underproduction while Ohno was concerned about overproduction. Both Taylor and Ohno wanted lower-level people to make improvements based on facts instead of opinions – especially the opinions of people who had power (“the boss”). Both Taylor and Ohno wanted to improve productivity and reduce costs. And Both wanted to create what Ohno would later call the “full work system” (see Ohno, Toyota Production System, pp. 59-60). When Taylor is vilified today, what is he vilified for? It is only two things. First, his approach to determining standards (standard work). He thought standards were best determined by an educated person (an engineer) specifically trained to do this type of job (i.e. time and motion study, with a stopwatch), and that there was “one best way” to do the work. The second was his view towards workers, which seemed harsh due to the words that Taylor used to describe workers in his writings and the manner in which they sometimes curtailed output, called “soldiering” (Ohno called it “waste;” i.e. waiting or idle time). So, despite the many benefits of the “Taylor system” compared to the conventional (zero-sum, win-lose) management practice of the day, it is these two things that people remember most and for which they vilify him today. But is right to vilify him for these two things? No, it is not. And here’s why. In the early development of progressive management, Taylor’s rationale for who should create standards was sensible and appropriate, and his view of workers was actually progressive for the times. It was far less harsh than the way most managers viewed both work and workers. In fact, Taylor’s views on standards (see pages 14 and 68-69 for an explanation) and workers was revolutionary for the day and far more humane and remunerative than was typically the case. Further, Taylor’s work evolved after his death in 1915 at the age of 59, to be more inclusive of worker input, and the “one best way” gave way to “continuous improvement.” The flow production system created by Frank George Woollard (ca. 1925) in the U.K., was influenced by both Taylor and Ford, and had as its principles, “Continuous Improvement” and “Benefit for All.” The Toyota Way principles, “Continuous Improvement” and “Respect for People,” are directly traceable back to Taylor’s work. To understand Taylor’s view towards workers and society, read the 13-page paper, “The Spirit and Social Significance of Scientific Management” by Morris Cooke (1913). The most concise explanation of the controversies surrounding Taylor’s work is found in a small, 103-page book titled, Primer of Scientific Management by Frank Gilbreth (1914). To clearly understand the difference between REAL Scientific Management and Fake Scientific Management, read Taylor’s lengthy January 1912 testimony to Congress. Like Lean management, Scientific Management is difficult to comprehend, and those who don’t study it thoroughly and carefully will surely misunderstand it as well as Taylor. To understand Scientific Management, you have to read a large body of work, not solely Taylor’s two papers (“A Piece-Rate System  and “Shop Management ) and his 1911 book, The Principles of Scientific Management. One must begin with works by the (mechanical) engineers that preceded Taylor (e.g. Henry Towne), as well as the works by Taylor’s contemporaries (mainly business owners, some consultants, and a few academics). These authors include Morris Cooke, Frank Gilbreth, C. Bertrand Thompson, Henry Farquhar, Carl Barth, Horace Drury, Harlow Person, Henry Gantt, James Dodge, Henry Kendall, Horace Hathaway, Harrington Emerson, Charles Going, Dexter Kimball, Hugo Diemer, and so on, as well as the works by industrial engineers that followed them such as Ralph Barnes and George Shepard (principally in the 1930-1945 time frame, and which includes Training Within Industry). You also have to read Taylor’s detailed biography written by Frank Copley. There were some 60 major works published on the subject of Scientific Management from between 1880 and 1935, and I own them all and I have read them all (that’s what professors do). Lastly, you must be aware that interpretations of Taylor’s work by academics – economists, social scientists, and even some historians – post-1945 is often incorrect in terms of Taylor’s intentions, the Scientific Management system itself, its intended outcomes, and the treatment of workers. The poor understanding that they have about Taylor and of Scientific Management suggests that they have done no research, little research, or poor research on this important topic. Or, they cherry-pick the two negatives to satisfy some ulterior motive. If it is the latter, then that is obviously reprehensible. If it is the former, then one wonders about the quality of the research that they have done regarding TPS and The Toyota Way. Did they cherry-pick the good stuff to gain a wider audience? Toyota has been far from flawless when it comes to “Respect for People.” It is not difficult to find two noteworthy flaws and loudly amplify them as others have done to Taylor. Nobody and no management system is perfect, and to idealize them is to mislead and deform the truth. The job of advancing progressive Lean management is made far more difficult, and likely imperils the existence of Lean, if misconceptions about Scientific Management are allowed to persist. So it is in Lean movement’s best interest to respect Taylor, to embrace Taylor, and to correct misunderstandings about him and his work. To do otherwise is to be a Lean hypocrite: respect some pioneers of progressive management while disrespecting others – and for reasons that are not fact-based. Taylor possessed the characteristics valued by Lean people: Hard work, get your hands dirty, know the job, do experiments scientifically, be creative, collaborate with workers, and create better (non-zero-sum, win-win) outcomes for employees, customers, investors, and society at-large (i.e. humanity). I am certain that Taylor, were he alive today, would be mystified at how people have remained stuck on two misinterpretations of his work (and Fake Scientific Management), the effort that people put into vilifying him, and how the great work of those who built on Taylor’s work, from 1915 through the 1950s, is so poorly understood, both on its own and in relation to Toyota’s management system. Toyota did not invent their management system all by themselves. They built on the work of others and made many very important contributions for which their admiration and recognition are well-deserved. Taylor’s work is part of the lineage of Toyota’s management system. It is the foundation of Lean management. Will the they acknowledge and correct their error for the sake of advancing Lean management? We will see. Nicely done article… Very relevant and insightful. In that regard, I see it as being a bit ironic that one of key tenets – if not the singular most central tenet of TRUE LEAN THINKING AND BEHAVING – that is, the need [for a practitioner/subscriber] to keep an open mind, has proven to be one of its most challenging features/attributes. Note: It may have something to do with the human psyche’s persistent need to create and sustain duality wherever unity might provide a more powerful and compelling perspective. In other words, biased, self-interest(s) – above and beyond naivety – tend to play a big role in determining what and why something goes mainstream. Hi Jay – Thank you. Excellent observation, that the need for open minds has proved to be very challenging among those who should have an open mind. “In 1881, an American, Frederick Winslow Taylor (1856-1915), first applied knowledge to the study of work, the analysis of work, and the engineering of work. . . .
“By 1930, Taylor’s Scientific Management — despite resistance from unions and from intellectuals — had swept the developed world. As a result, Marx’s ‘proletarian’ became a ‘bourgeois.’ The blue-collar worker in manufacturing industry, the ‘proletarian’ rather than the ‘capitalist,’ became the true beneficiary of Capitalism and Industrial Revolution. This explains the total failure of Marxism in the highly developed countries for which Marx had predicted ‘revolution’ by 1900. . . . It explains why the Great Depression did not lead to Communist revolution. . . . By that time, Marx’s proletarians had not yet become affluent, but they had become middle class. They had become productive. In follow-up to the Note in my prior posting – and in connection with Sid’s extract from Deming’s Post-Capitalist Society – I am inclined to suggest that more so than Freud being a critical member of that triumvirate/trinity-of-transformation, it was his nephew, Edward Bernays, who put Freud’s theories into action in a modern-day capitalistic context. It was Bernays who was the progenitor of the methods/tools/techniques that define modern-day marketing, and which focus predominantly on closing/biasing the minds/thinking of the masses… rather than opening them. And the purpose behind doing so is to… make money, and lots of it [often at any cost to society at large]. In your article you write “The negative association brings out the Lean bigwigs and others who work hard to create a great separation between Lean and Taylor”. I appreciate the fact that the Lean bigwigs were the folks that really “opened up the world” to what Toyota has done, and continues to do. But, speaking as an IE academic who also has decent industry experience under his belt implementing Lean/JobshopLean, these bigwigs do not get it that Lean is implemented using weak pencil-and-paper “Lean tools” that are basically Industrial Engineering. Taylor, Gilbreth, etc., did “Lean in their day”. Other US thinkers did Lean thereafter through the TWI. Toyota picked up on that and did even better. What did the Lean bigwigs themselves do besides reporting what these past bigwigs did for them? As an Industrial Engineer, I’d really take issue with the idea that Lean tools are just IE methods. There are tools, many drawn from IE methods, but TPS is also a philosophy, a culture, and a management system. I don’t think that’s all drawn from IE. Lean isn’t just a scheduling methodology. You’re right Mark of course. Irani has been promoting the ‘lean is nothing more than slick i.i.” for years. As an IE it is apparent that he never rose above it and falls under the old adage, when the only tool you have is a hammer all of your problems look like nails. To his question, “what did the Lean bigwigs [like you] do”? the answer is that they and you have transformed organizations to heights the lean tool jockeys like Irani can’t even imagine. Of course, Lean is not a scheduling methodology! IE encompasses ergonomics, scheduling, facility layout, warehouse design, employee training — everything. Sure, it does not fully encompass management and employee development. But, I will stress that superficial IE, which is what the Lean tools are, is one of the key reasons why Lean does not sustain. Probably not the first because Lean lives and dies with executive leadership. Consider buying an IE handbook to see the comprehensive role that an IE grounded in Lean principles could play. Lean is just superficial IE? You could have a wide range of deep IE methods in a Lean organization. Lean / TPS is technical methods, a philosophy, and a management system. I take offense in this comment as the message that came across to me is that “IE is just a scheduling methodology”. As this site is often visited by those who are researching, I need to correct this so as not to misinform the public. Let me enumerate some courses offered in the IE curriculum in my university: Methods Engineering, Statistics, Operations Management, Financial Accounting, Management Accounting, Micro-economics, Design of Experiments, Game Theory, Markov Chains, Simulation, Computer Programming, Fluid Dynamics, Unit Operations for Chemical Engineering, Feasibility Analysis, Strategic Planning, Ergonomics, Properties and Manufacturability of Materials, Strength of Materials, Manufacturing Technologies, Engineering Sciences, not to mention Physics, Chemistry, Industrial Psychology, Fundamentals of Management, etc. Industrial Engineering is a 5-year course. Lean training, 4-weeks? Reynald – I am an industrial engineer. I said, in my comment, that I.E. is NOT just a scheduling methodology. I don’t know who was ever fully trained in Lean in four weeks. “As an Industrial Engineer, I’d really take issue with the idea that Lean tools are just IE methods. Reynald – “isn’t” means the same thing as “is not.” I wrote “Lean isn’t just a scheduling methodology.” I’m not sure why this is confusing. Very good article Bob. We have tangled in the past and I think you over-rate Taylor and under-appreciate Gilbreth but that is a fine point. Toyota clearly stood on the shoulders of giants that came before them – did more synergizing than inventing – and there is no doubt Taylor was one of those giants. I agree with Bill that you overrate Taylor and under-appreciate Gilbreth, but I don’t think it’s a fine point as their philosophies were radically different. Taylor wanted to prevent workers from goofing off; Gilbreth, to make their work easier to do. Taylor is explicit about this, and Gilbreth’s films make the point eloquently. Everybody who does anything stands on the shoulders of those who came before. In the case of Toyota, the external inputs were gathered by 1955, and not just from the US. Toyota’s development since then was mostly autonomous. The term “Scientific Management” bothers me, because I really think that Taylor’s approach is neither. There is more to management than just the design and organization of individual work stations. And time studies, differential piece rates, and functional foremanship don’t add up to a science. “Efficiency Engineering” would be more descriptive, even if much of it was never used. Hi Michel – You and Bill misunderstand me. Firstly, it’s not Taylor or Gilbreth. It’s Taylor and Gilbreth and many others. Second, for whatever reason, all criticism flows to Taylor (and Taylorism), so that’s what needs to be addressed. Third, The literature on Taylor and Scientific Management is voluminous compared to that on Gilbreth and his work (and therefore global in terms of its influence). I don’t say that to diminish Gilbreth or his work; only to point out a fact. Taylor and Gilbreth were contemporaries sympathetic to one another’s work. They were working for and promoting the same thing, much as we do today with Lean. My point is that Lean community leaders should embrace Taylor (and Gilbreth and all the others in that era) in order to advance Lean, rather than run away from it. Ideally speaking, what ALL TRUE LEAN THINKING AND BEHAVING practitioners and community MEMBERS (NOT JUST THOSE WHO ARE MANIFESTING TRUE LEADERSHIP THINKING AND BEHAVING) should be embracing is NOT the work/contributions of all of the individual contributors, but much more so the sort of D.S.R.P. THINKING that will enable them to achieve a much higher order comprehension of and potential synthetic and holistic application of their respective bodies of work. We need to study in depth and not mistify the reality. Taylorism is a large cultural approach, and Training Within Industry program demonstrates how Japanese used Taylorism to build JIt/Lean. I really liked this article. Sometimes, I feel the story of the ‘Blind men and an elephant’ applies to how Scientific Management is usually viewed and understood. I agree with Professor Emiliani that the elephant in the story of the ‘Blind men and an elephant’ should not be blamed for how it is viewed and understood by the blind men. YES!!! TRUE LEAN THINKING AND BEHAVING, as manifest in its current state-of-the-practice form – that being the TPS/Toyota Way – is no simple “animal” to get one’s arms and mind around. As a SYSTEM, it rivals the creations of Mother Nature in terms of its complexity, operational efficiency, multi-dimensional adaptability, and resiliency. In order for it to work as desired/intended, all elements of the overall SYSTEM must act in harmony with one another and be focused on a higher-order state-of-being. Those elements include the likes of: the IE-derived methods/tools/techniques and managerial frameworks that enable the end-to-end processes to function in an optimal manner and continually respond/adjust to the dynamic conditions that exist in the business/operational environment, the NPPD/I-related competencies and capabilities that are essential to responding to the VOC and progressing toward a desired/target future-state vision and realizing/manifesting the organization’s TRUE NORTH ORIENTATION, the human-competency development… are all required in building and sustaining a world class SYSTEM. And in this regard, the competencies and capabilities that need to be inherent within and innate to the SYSTEM also need to be “LAYERED” into a tightly-integrated and holistic framework… starting with the fundamentals of operational excellence – at the lowest level – and building up and out from there. So, when arguing any specific point or points regarding LEAN’s TRUE nature and/or make-up, one needs to be acutely aware of where one is standing relative to the make-up/composition of the entire SYSTEM. This is one of the key/prime reasons I place so much emphasis on the need for TRUE LEAN THINKERS AND DOERS to possess a D.S.R.P.-THINKING competency. Without it, there are more than likely going to be a never-ending stream of mental model disconnects. It’s easy to blame Taylor. We just need to recognize his work had its time and place and influenced the work of others that came after him. Taylor had the best interest of the industry at heart and tried to change things based on his understanding of what motivated humans (at the time). Love to read the debates between the experts. Interesting article and discussion. I agree with the discussion point added by Bob that what we know today evolved through the work of our predecessors. I’ve always felt that 60% of the basic tool set in lean, six sigma, TQM, etc. came from traditional I.E. Interestingly though lean thinking (more so than the other improvement methodologies) turned the focal point on where those tools get used by 180º. Traditional I.E. under Taylor focused on Value Added Time and overlooked all the other time surrounding the actual work. Not a criticism of Taylor. We needed to start somewhere with ‘scientific thinking’ in the work place. What is interesting is how long it took for a critical mass of companies to understand that most of the waste was completely outside of the value added time… which was a minuscule component of overall time. I posted this thread in a previous thread on Taylorism. I agree with Michel (Baudin), Taylorism has been used as the dumping ground for many ideas that have nothing to do with him. His work in the late 19th century laid the foundation upon which others have built. He was also a product of his time in terms of the management and worker divisions and attitudes. Attitudes we now find unacceptable; but this is 120 years later. We should not let this detract from excellence of most of his original basic thinking. I still think he deserves the title, ‘Father of scientific management’. As a young work-study engineer and rate-fixer in the 1960’s, my main sources of information was not Taylor’s original material, but all my trainers and the authors of my study material referred to Taylor and the Galbraith’s as the original source for ‘Scientific Thinking’ and ‘Time and Motion Study’. I cannot have been alone in finding this material inspiring. When I move into the metal cutting industry, I used Taylor’s tool life equation and its expanded form, as an essential tool for analysing tooling performance and metal cutting economics. Taylor: “The world suffers now, as it always has from underproduction. Underproduction is responsible for low wages, and the reason the poor have fewer things in terms of the basics and luxuries to live on. Have poorer food to eat, pay higher rents and can afford fewer clothes. The only way to bring these things into the world is to increase output. Scientific management is about increasing the output of the man without increasing his effort. I firmly believe in the next 100 years the wealth of the world will grow to such an extent that the workman of the day will live almost as well as the high class businessman lives now; both as the necessities and luxuries of life”. I will leave the final word to someone we all admire; and is considered by many to be the father of modern management. 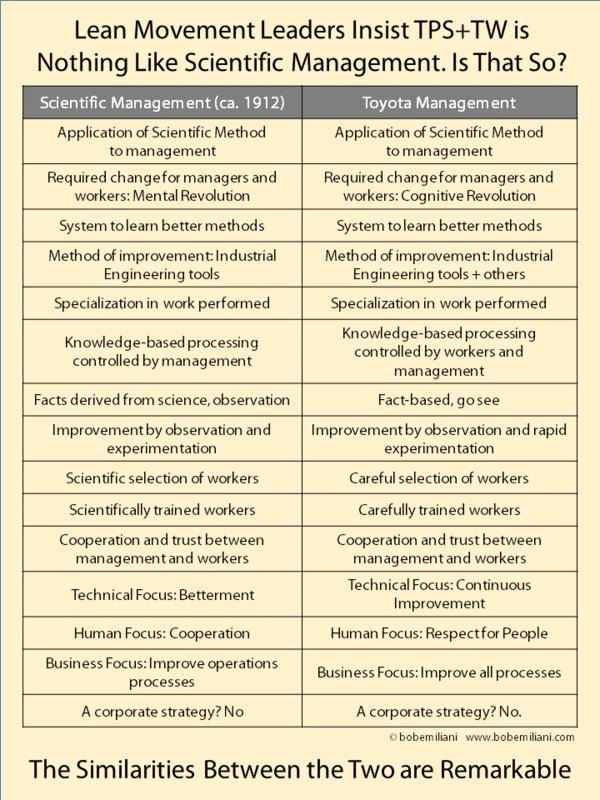 On my first few visit to Japan to study the Toyota Production System, I quickly appreciated that they had developed their own form of ‘Scientific Management Thinking’. The main difference to the Taylor model was that they had engaged all their people positively in the process. Let us hope our present improvement methodologies have as much impact on human prosperity in the next one hundred and fifty years, as those of Taylor and the Gilbraith’s have done over the last one hundred and fifty. Another good article Bob in the fight to correct the misleading image of “lean”. I think the term itself doesn’t help in the sense that obviously one would not seek “fat ” management but inevitably it’s what happens. Keep up the good fight. Scientific management, to deeply understand the work at hand for the purpose of improving the condition and outcome must involve reasonableness and be forgiving in application. Surely Taylor did not leave psychology out of the equation; otherwise he would be a human. The good professor knows! Bob, what a masterful article. Thanks for the much needed references. Best regards. What a well written and thoughtful article by Prof Emiliani. Should Adam Smith 1723 – 1790, …the Invisible Hand concept and Division or Labor, also be included as one of the original Lean Thinkers ?